Clare Morrall’s debut novel, Astonishing Splashes of Colour, was shortlisted for the Man Booker Prize in 2003. Since then she’s gone from strength to strength, her seventh and most recent novel, When the Floods Came, is out now. Twenty years after the world is ravaged by the Hoffman’s virus, twenty-two-year-old Roza Polanski lives with her family in an empty tower block. With her mother, father, two younger sisters and a brother, she lives in an overgrown area of Birmingham, alternating between sheltering from the floods or the sweltering heat. Her parents are unusual, lucky to survive the virus and then even luckier to finds themselves to conceive. Children are a rare and much-valued commodity. When she begins to notice little cat drawings in places she hasn’t noticed before she starts to wonder if someone else is out there, someone trying to send her a message. A while later, as the snow begins to fall and they’re confined within the block, a young man reveals himself to the family. Trapped with a stranger, stronger than any of them, they are forced to trust he has good intentions but where did he really come from and are the stories he tells about other survivors true? Clare Morrall creates an easily imaginable not-too-distant future with When the Floods Came, with a virus sweeping across England and eventual change of our ecosystem, creating a harsh environment for the Polanski’s to survive in. They manage on their own, collecting survival drops, scavenging from the various flats in the block and learning how to fix the items they need. The stranger, Aashay, shakes their world up by offering them the chance of more. More people to interact with, more children to play with, more hope for the future. But the Polanski’s do have a secret of their own to hide, giving them a depth and an extra vulnerability that makes their choices even more daunting. Spanning a number of genres When the Floods Came could be described as literary, sci-fi, dystopian and a thriller, all being accurate. Mixing in childhood lullabies to add context and impact is also a unique twist that I really enjoyed. Overall When the Floods Came is a powerful tale of trust and deceit set in an all too imaginable future. If you enjoy the bestseller Station Eleven by Emily St. John Mandel then this will be right up your street. If my review has you intrigued then you’re in luck! Below you’ll find the entire first chapter of When the Floods Came for you to enjoy. cloak of moss, is pleasing. have no intention of missing any of it. enough for me – and I wanted to offer him something personal. my response. ‘Very well, Hector,’ I said. substantial as a holo. I don’t like kissing air. assigned position and proving himself to be an original thinker. was still possible to travel during the winter months. seen photos of adverts from old newspapers. she was old enough, my sister Delphine, six years younger. a secret door somewhere in the apparently seamless construction. south, a small arc in the giant protective ring around the city. guarded with zealous vigilance by women, one for each child. the women closed in, a human barrier between them and us. ‘Walloo!’ shouted Delphine. ‘Over here! We’re the Polanskis. ‘Can we race you?’ yelled Boris. their function and their words. ‘Sorry!’ A voice trailing through the wind, lacking conviction. imagined arriving in front of their home, knocking on their door. film that presented an image of people as they used to be? you, that you must never tell anyone where we live?’ he said. ‘But who are they?’ said Boris. ‘Where do they come from? ‘Where do you come from? Where do you go? Cotton-eyed Joe; speed; home in time for tea. floods, but clinging on, the blood vessels of the old world. grown up round the fence. me, struggling to keep up. still prepared to report back to Popi. Go for it, Roza! No reservations from Boris. the lowest part, up the opposite slope into heat and sunshine. supermarkets when he’s feeling nostalgic. could manage a quarantine,’ said Popi. when all the people died, that form of Hoffman’s died with them. Moth are part of a tiny minority with genuine immunity. Understatement. Popi’s civilised response to the world. Why would he worry about me being here? dishonest promise to Hector, and the short time before he arrives. If it wasn’t true when I said it, maybe it should be in the future. left lying around in the hall – but we all know it’s important. images on the Art Mall, but Popi is contemptuous of online art. can’t start this early. Why didn’t the meteos warn us? Lucia, they say, without actually saying it. My visit to the art gallery will have to wait for another time. Just before I leave, something catches my attention. 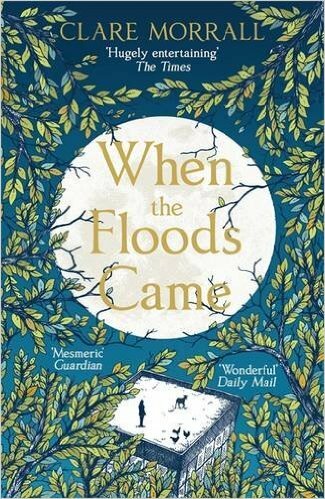 Buy your copy of When the Floods Came by Clare Morrall from Amazon here.